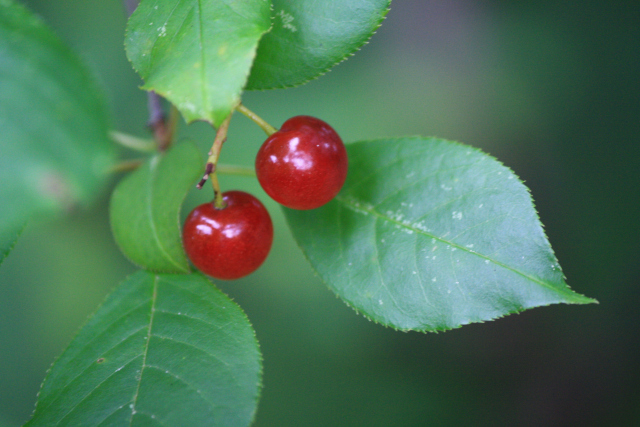 Chokecherry (Prunus virginiana), with its polished red fruit looks delectable, but like the name forewarns, has a decidedly astringent taste. I admire and love the dark crimson color against the green leaves. As a child, I was always attracted to their inviting color, but warned strongly against sampling any. Once mischievously, I ate one anyway and quickly spat it out – lesson learned! Chokecherries, both flowers and leaves, are an important food source for moths and butterflies, including Cecropia, Io and Sphinx Hawk moths, Eastern Tiger Swallowtail and American White Admiral butterflies, as well as the dreaded Tent Caterpillar, which can spread to domesticated fruit crops. (You can see munched leaves in the above photo). Birds enjoy the fruit and likely rodents do as well, once it falls to the ground. 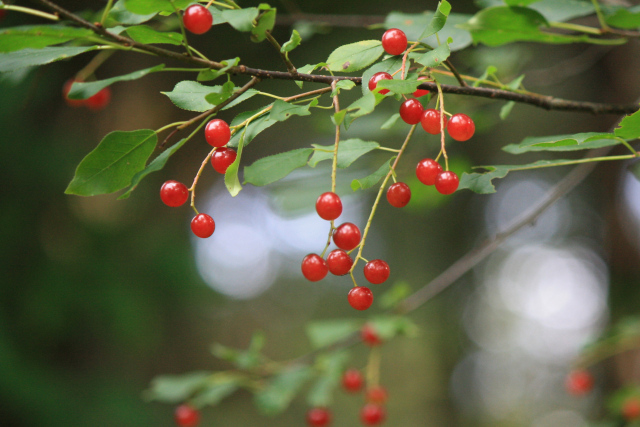 Along with its cousin, Black Cherry (Prunus serotina), rodents will cache the stone pits to eat through the winter.